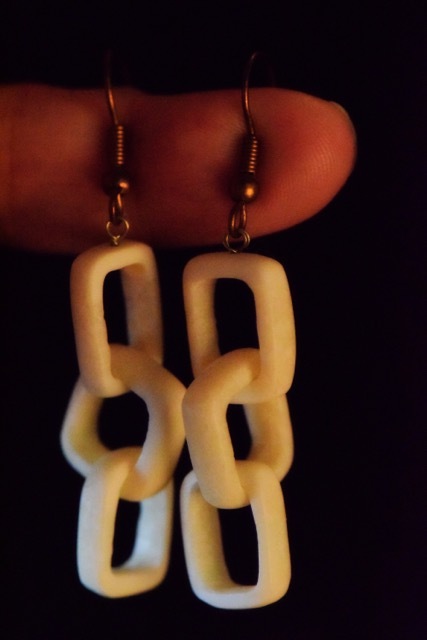 I've written about my love for ivory carvings before, but I haven't mentioned my love for walrus ivory jewelry. Every once in a while somebody stops by our house or my classroom to show me ivory jewelry. Sometimes it's the carver stopping by. Other times it's the carver's son, daughter, honey, or cousin. 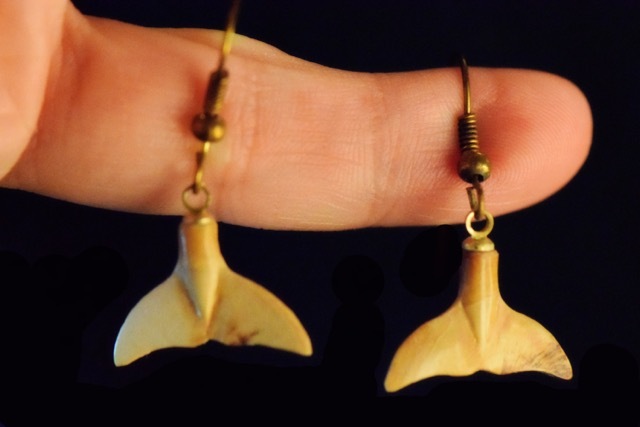 These earrings are whale tails carved out of old ivory. Old ivory is brownish. 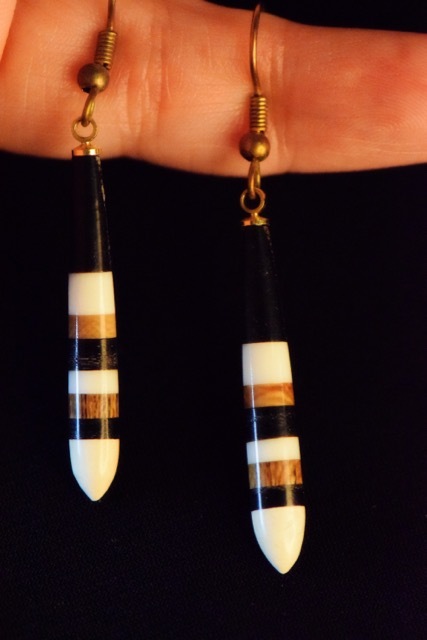 This pair was made by Harvey Pootoogooluk. He was one of my students in Shishmaref. Most people called him Morshik. 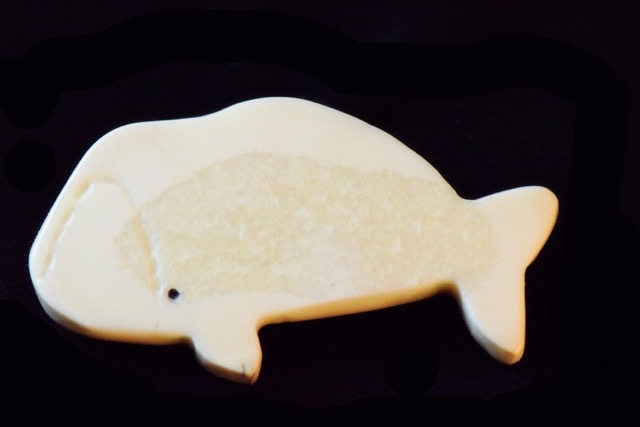 The white-ish parts are walrus ivory. The brownish parts are old ivory. I think the blackish parts are from mastodon tusks. 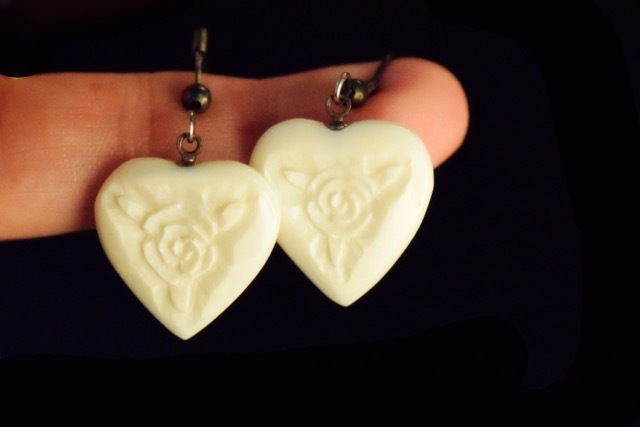 I bought this pair of earrings when I visited Shishmaref with my mom after we'd moved to Brevig Mission. This beautiful pair was made by Willie Olanna. This style of earrings was one of his specialties. 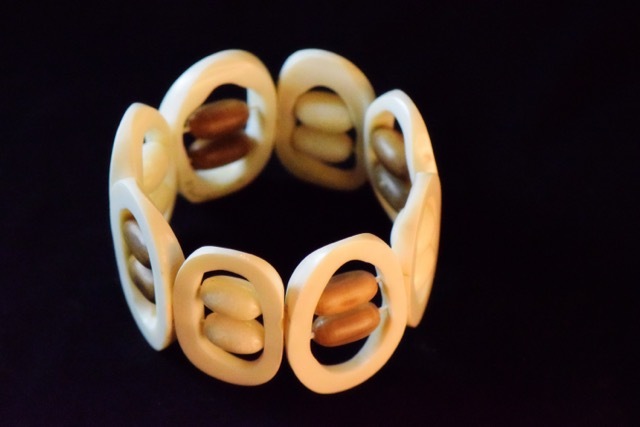 One of the benefits of buying walrus ivory jewelry in the village is that it's usually less expensive than if you bought it at a gift shop in Nome, Anchorage, or Juneau. 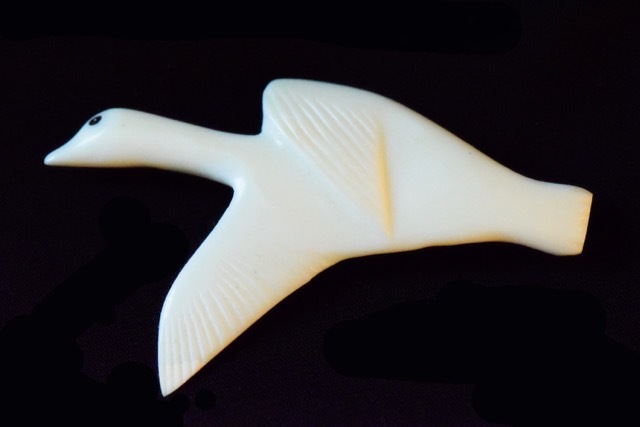 This crane brooch was also made Willie Olanna. It's another classic Willie design. These amazing earrings were made by Fred Nayokpuk. He's the father of one of my former students (who was also in Steve's class!). 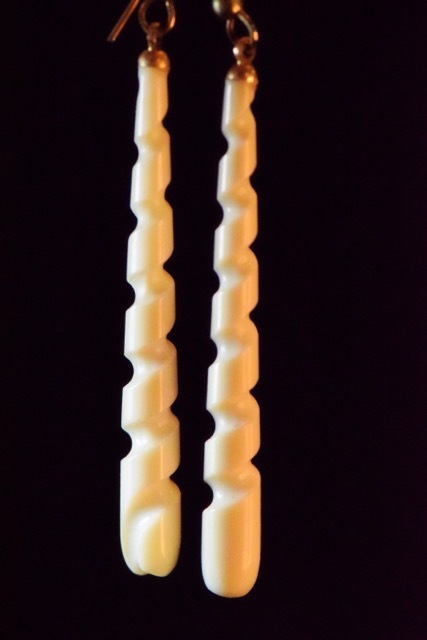 The fact that Fred can carve interlocking chain links from a single piece of ivory blows my mind! This bracelet was also a Christmas present. It was from Kaitlyn's family. At Christmas in Brevig Mission all of the willing adults participate in a name pick. Our names are written on slips of paper and put into an empty coffee can. City employees bring the can around and let people draw a name. You buy a present for the name you drew. You bring it to the Christmas Eve church service, but you don't put your name on it. You just write: from namepick. When they pass presents out, your name pick doesn't know who it came from. It's a big secret. The above pendant was my name pick gift a few years ago. I later found out that it was from the girlfriend of a former student. She had him carve it just for me. 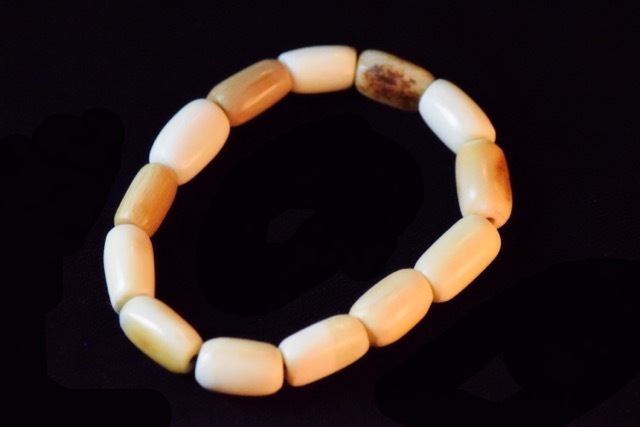 This was the first ivory bracelet I ever owned. 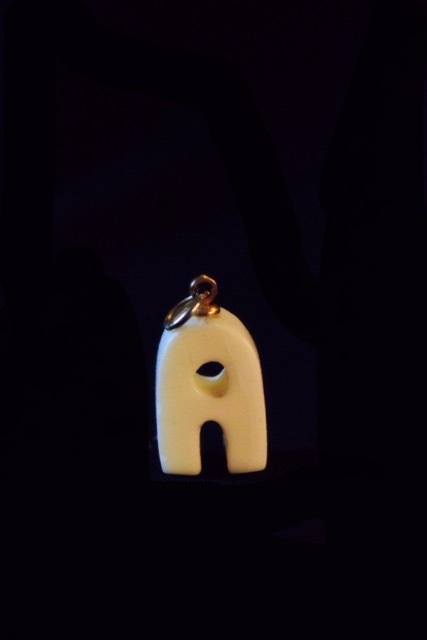 It was made by Delbert Jones out of old ivory. It has three dimensional animals all around it. I only wear it on special occasions like Christmas and graduation. 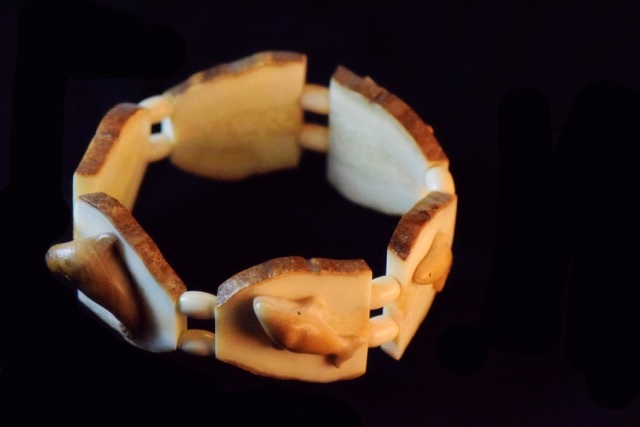 I've slowed down buying walrus ivory jewelry (kids are expensive!). Now I only buy unique pieces that are really different from any other in my collection.